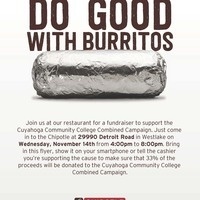 On November 14th from 4:00 PM to 8:00 PM, enjoy Chipotle and support the Cuyahoga Community College Combined Campaign. Just come in to the new Chipotle, located in West Bay Plaza. Bring in a flyer, show it on your smartphone or tell the cashier you’re supporting the cause to make sure that 33% of the proceeds will be donated to the Cuyahoga Community College Combined Campaign.